Do you feel like you need a little “lift”? Do you want to look fresher? Are you worried about the lines from smoking or Crows feet? 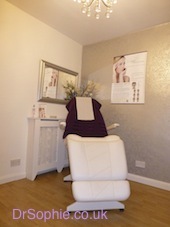 Dr Sophie has over 10 years experience in helping women retain their looks and make the most of their natural beauty. What skincare treatment do you need? There are many questions that you might have and a free consultation will answer all of your questions. These are all questions that Dr Sophie answers on a regular basis, and each answer is different as it’s based on you, your skin type and your lifestyle. Find out more about Dermal Filler Treatments such as: Restylane, Perlane, Juvederm, Radiesse and Belotero……. Find out more about Botox and anti wrinkle treatments….